I'm not going to deny the fact that I enjoy McDonald's. Obviously, I know that it's not good for you but I still go every now and then to indulge. I will have a gourmet burger more frequently from a local cafe as it's better than the fast food burgers. McDonald's Australia must be feeling this in the profits, as it looks like they are trying to compete with the more gourmet burger chains (Grill'd, Urban Burger etc.) with their new 'Create Your Taste' menu. They've also gone high-tech with touch displays to order yourself and new LCD screen menus that rotate through options and include advertising shots of the food to entice you. After seeing this I decided that I had to go in to play with the displays, you know for UX research and totally not because I wanted an excuse to eat McDonald's. 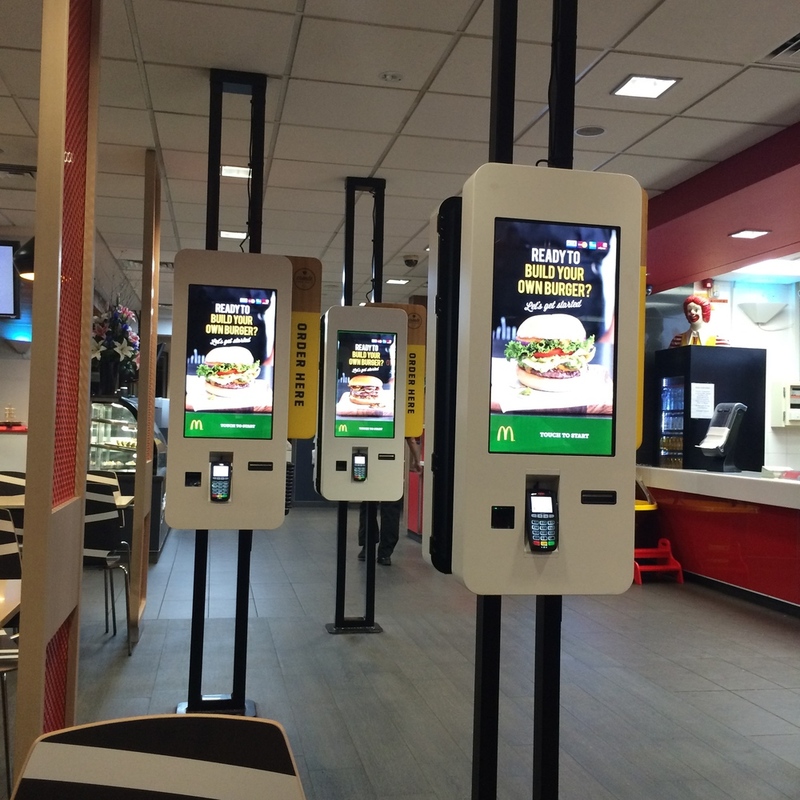 McDonald's Australia's new Create Order Screens - in selected Stores. McDonald's Australia's new LCD menu screens. Getting started with the touch screen was easy. Really clear what to do, what choice I'm making between Eat In and Takeout and that I can't pay at the terminal using cash, only card. That's slightly annoying, given that if I'm using the terminal I perhaps don't want to talk to a human, but fine for phase one. I wanted to do the 'create your taste' option to build my own burger, but it wasn't clear that the top option was a button - I thought it was the title of the page and the only option was the burgers below. Within a few seconds of my confusion an employee came over to assist me. Building The Burger had a few issues. It was easy to pick which bun I wanted, but the next page was a bit confusing. The beef patty is automatically selected, which is good, but I didn't notice so I accidentally removed it and had to add it back. Some of the items are $1.00 each, and some $0.60 but this is not indicated on the screen until you add them to the burger and it pops up saying +60cents. The 'Scroll for more' indication text is over the pineapple; I clicked on this expecting it to scroll and accidentally added this to my order. The screen can be scrolled like a normal Smartphone / Tablet device - pushing the screen up. Given the experience with meat & extras this I wasn't sure if the salad fillings on the next screen cost anything or not, but apparently they were all free. I wanted to make my burger into a meal, including fries and a drink. The drinks option loaded half way down the screen with no indication that you could scroll up, as well as down - this was very confusing and I would not have known what to do were it not for the customer service staff telling me. I added a coke and it defaulted to medium; downgrading to small is 50cents less and upgrading to large is 50cents more. The defaulting is fine, however it displays the drinks in the order: Medium, Small and Large- this is cognitive dissonance as we are used to seeing things as Small, Medium and Large. Once you've finished building the burger it takes you back to the home screen and you can see if your burger is in the cart. It wasn't. This made me think I'd lost the burger I just spent 3 minutes making and gave them a minor heart-attack and a flash of rage. Luckily it just took a few seconds for the order to display in the 'cart' section of the screen. You are given one last chance to confirm your order before it is sent to the kitchen. The table number you have to pick up is from a pile around the corner of the display and it is not clear that you have to grab one of these and press and corresponding number on the screen. After the video ends all I had to do was easily tap and pay with Pay Wave and take my receipt. A few improvements could be made to the interface, but overall (with the staff assistance) the process was fairly easy and the burger delicious and seemed healthier than the normal choices. It would also be nice to be able to pay with cash through the machine. I didn't look at the unhappy path of needing to change your burger so that would be interesting to evaluate too. I found it interesting that you could only make a beef burger, but perhaps the options will expand in later iterations. I must say that the gimmick worked as it got me in to store to try it and write about it.